Ebola haemorrhagic fever is a viral disease that is very often fatal. Three of the viral sub-types found in the Democratic Republic of Congo (formerly Zaire), the Sudan and the Ivory Coast are pathogenic to human beings. Ebola virus haemorrhagic fever is a haemorrhagic disease which is fatal in 50% to 90% of patients with clinical manifestations. Human infection by the Reston sub-type of the Ebola virus, which is seen in the Western Pacific has remained silent to date: people who contract it do not develop any symptoms. The natural reservoir appears to be in tropical forests in Africa and the Western Pacific. The Ebola virus is transmitted by direct contact with blood, secretions, organs or biological fluids from infected people. Funeral rites during which relatives and friends come into direct contact with the body of the deceased play an important role in transmission. Ebola virus has been transmitted to human beings after handling living or dead animals carrying the virus: chimpanzees, gorillas and wood antelopes. Transmission of the Reston strain has also been reported after handling Buffon macaques. 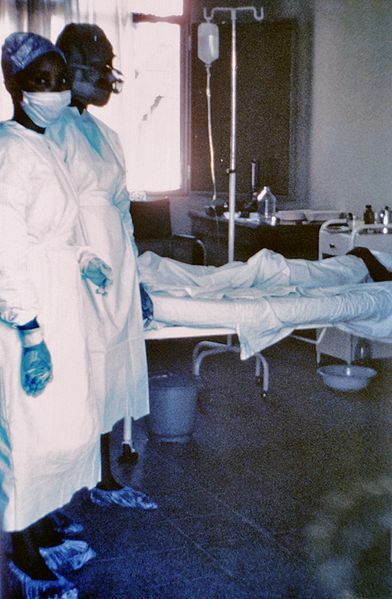 Health workers have frequently been infected after contact with patients whom they have treated without taking the necessary anti-infectious precautions and without using isolation care methods. The incubation period varies between 2 and 21 days. Ebola haemorrhagic fever often presents as a sudden rise in temperature with intense weakness, myalgia, headaches and sore throat. The fever is often followed by vomiting, diarrhoea, skin rash, renal and hepatic failure and internal and external haemorrhaging. Laboratory tests show a reduced white blood cell and platelet count and raised liver enzymes. Specific tests on blood samples show specific viral genes or antigens. Antibodies can be detected against the virus and the virus can be isolated by cell culture. These laboratory tests carry a very high biological risk and must only be performed under the strictest of containment conditions. Diagnostic technological advances have led to the development of non-invasive methods (on saliva or urine samples) and on inactivated samples which speed up the laboratory diagnosis and therefore help in the management of cases and in combating outbreaks. Serious cases must be admitted to intensive care units as the patients are often dehydrated and must be given an infusion or rehydrated orally with electrolyte solutions. There are no specific treatments or vaccines for Ebola virus haemorrhagic fever. Several candidate vaccines are being tested, one of which is believed to have saved the life of an accidentally infected researcher, although this has not yet been validated. A new medical therapy is showing promise in the laboratory. This is continuing to be assessed although the process will undoubtedly take years. Experimental studies on the use of hyperimmune sera, carried out on laboratory animals have not shown any protection against the disease.